I always try to turn our Sundays into a 'feasting Sunday' by cooking something special. During my growing years, I saw my mother cooking an array of delicacies on Sundays. After we would come back home from tuitions or from playgrounds and refresh ourselves, a plate full of various gastronomic delights served in front of us in the afternoon would uplift everyone's mood and we would start cheering on the food and our mother who painstakingly made all the efforts to indulge us with a nice meal. Now in my own home, I try to do the same and give the same foodie pleasure to my family on Sundays. 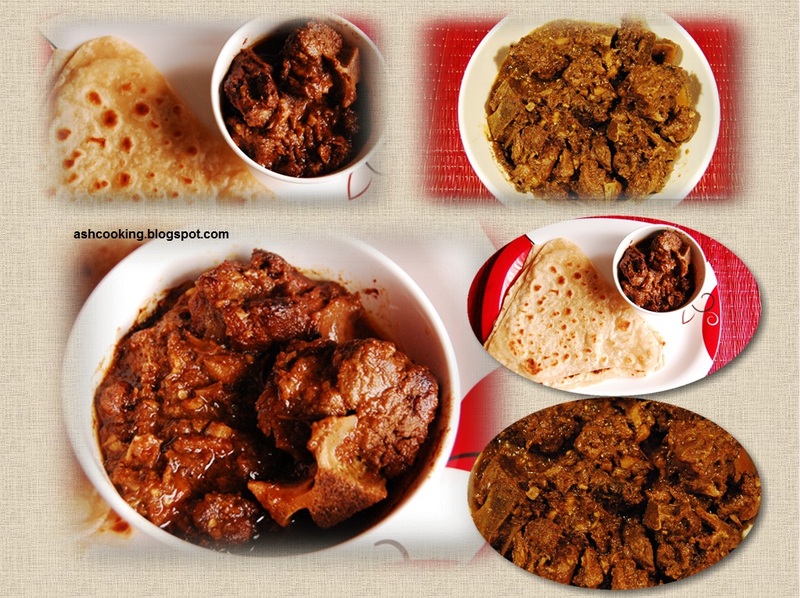 The following mutton curry is an ideal cuisine for Sundays. I learned the recipe from a cookery show hosted by Aditya Bal. Undoubtedly; I have become his great fan. 1) Place the mutton into a large pot, add water, salt and mint leaves. Bring it to a boil. Then strain the juice. Mutton stock is ready. Reserve it for further use. 3) Heat oil in the cooking vessel. When oil becomes hot, add ginger and brown them. 4) Next add the mutton. Sear and brown them. Then add onion paste and combine it well with the mutton. Cook till onions turn translucent and the water content in the onion evaporate. 5) Now pour 1 cup of mutton stock into the bowl of marinade and scraping out the residual marinade pour this into the mutton. Simmer it away. Add the chopped garlic in between. 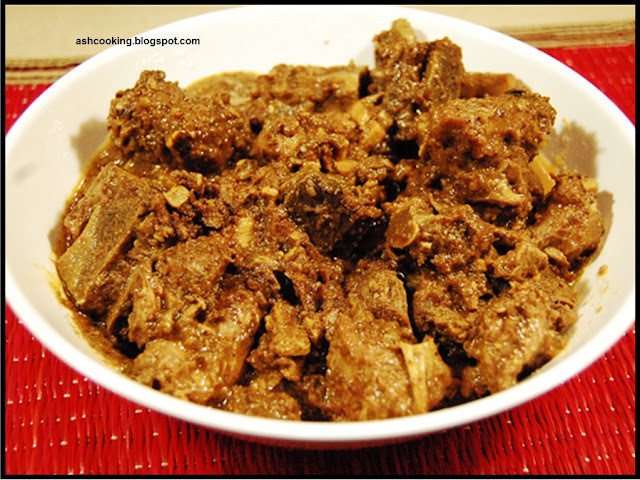 6) When the mutton mixture gets dry, refill it with mutton stock depending on your need for the gravy. This way cook the mutton till it turns mushy. 7) Finally when mutton seems done, add ghee followed by rose essence. You may sprinkle some chopped ginger on top if you wish. 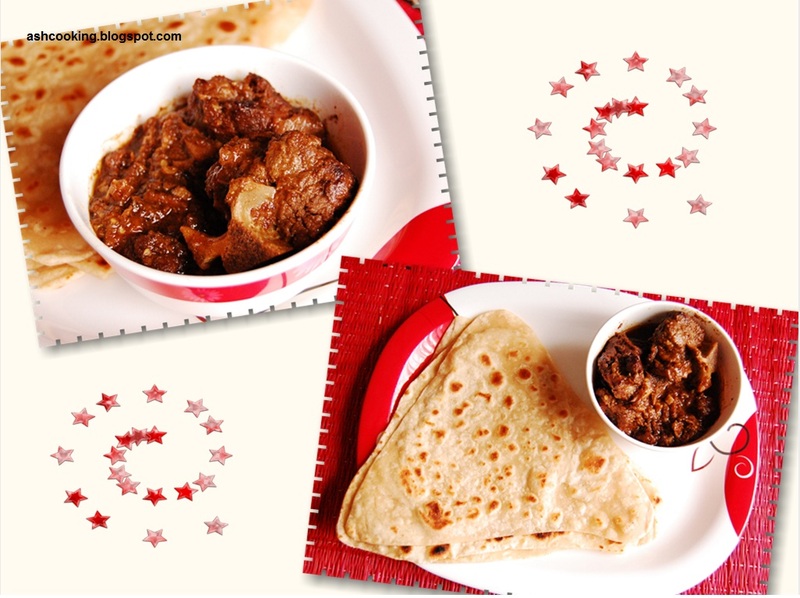 8) Serve it with paratha, pulao or rice.